Few things are better in the winter than a big bowl of hot soup (unless there’s a grilled cheese with the soup, which is better), and this easy Coconut Curry Chickpea Soup definitely fits the bill. 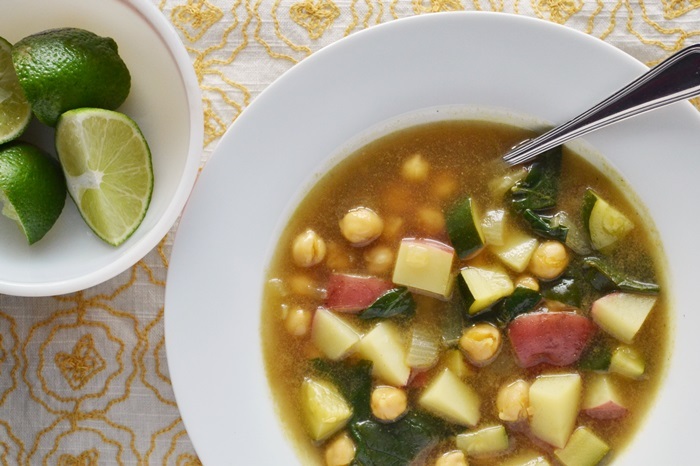 The curry powder, coconut milk, lime juice, and brown sugar give it special flavor and sweetness, while the chunks of potatoes, zucchini, chickpeas, and fresh spinach add hearty heft. I like this soup because it has a good flavor profile without being fussy. So often I will see a soup recipe that looks amazing, but a quick scan of the ingredients has me mentally moving on. I can pick up a few extra vegetables and a can of coconut milk without any trouble, but sometimes the thought of peeling ginger, hunting for harissa, and buying 4 different kinds of fresh herbs in the January (in soups I feel strongly about fresh over dried) just feels like a few steps too many, at least on a weeknight. I got this recipe in a book I picked up in a major haul at the Cambridge Galleria Mall Borders Books store-closing clearance sale a few years ago (RIP Borders). Titled simply “300 Sensational Soups,” it didn’t look like much and lacked photos, but a lot of recipes caught my eye when I did a quick flip, so I bought it. I love soup, and this book has chapters dedicated to varieties like chilled, cheese, fish, meat, poultry, chowders, global, and sweet dessert soups, not to mention sections for stocks and homemade garnishes like pesto, croutons, and matzo balls. Each recipe also has a helpful tip, which in most cases, is actually helpful. For this recipe, they suggest garnishing the soup with toasted coconut and tell you how (I didn’t). It’s a filling and delicious soup with a lot of flavor and I’ll definitely make it again, especially when the temperature drops. Winter, I confess, is not my favorite season. I don’t ski or snowshoe and I hate being cold, plus the dry air turns my skin into a nightmare (this is why when my sister asked what I wanted for Christmas this year I paused, then answered “a humidifier”). Thankfully, my apartment gets a good amount of sun during the day, so I’m muddling through. 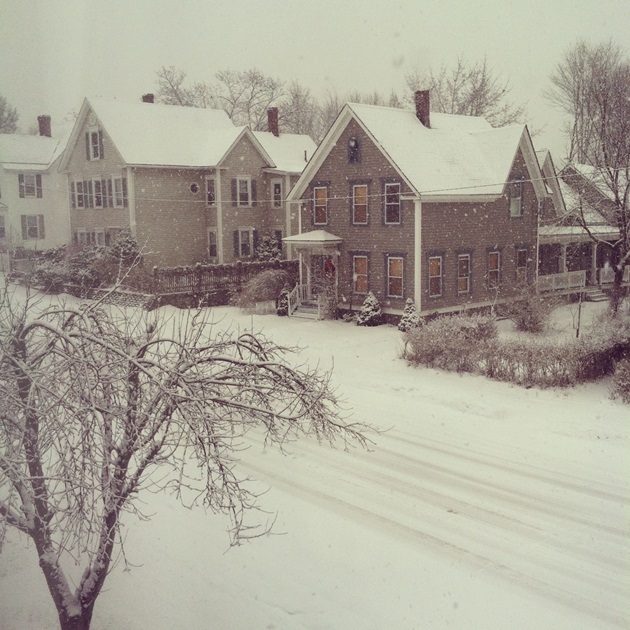 At least my street looks pretty when the snow falls! In a large Dutch oven, heat the olive oil over medium heat. Add the onions and garlic and saute until translucent but not browned, about 5 minutes. Add the curry powder and potatoes and stir to coat. Let cook, stirring constantly, for one minute. Add the vegetable stock (6 cups for a thick soup, 7-8 cups for a thinner soup) and coconut milk and continue to cook at a simmer for 10 minutes. Add the chickpeas and zucchini and continue cooking an additional 10 minutes, or until the vegetables are tender. 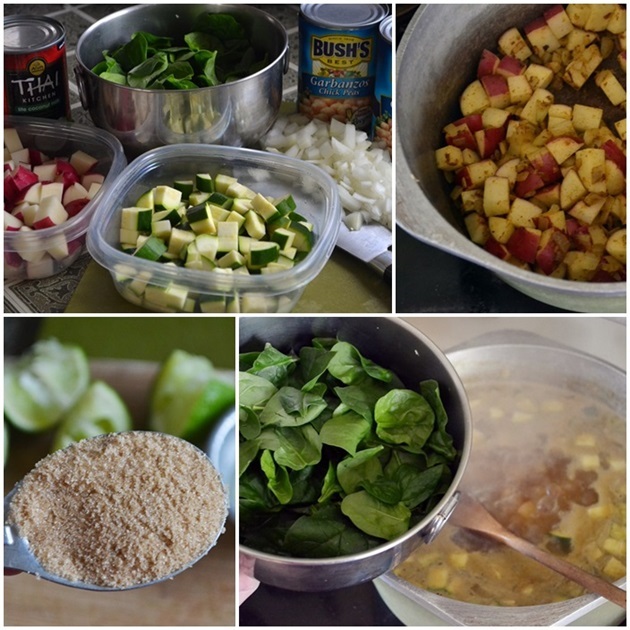 Add the brown sugar, lime juice, and spinach, stirring until the spinach is wilted. Season with salt and pepper to taste, then serve hot. 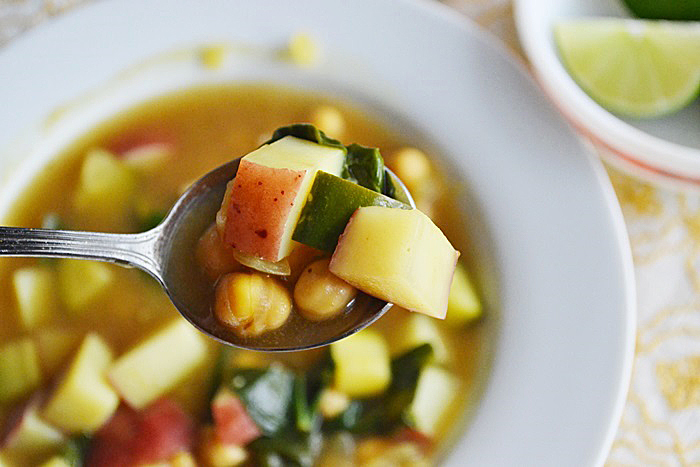 View and print the recipe for Coconut Curry Chickpea Soup. I love using chickpeas in soup, and I also love anything with curry in it! I need to make this ASAP.